1 By its appeal, the Government of Gibraltar seeks to have set aside the order of the General Court of the European Union of 24 May 2011 in Case T‑176/09 Government of Gibraltar v Commission (‘the order under appeal’), by which the General Court dismissed as inadmissible its action for partial annulment of Commission Decision 2009/95/EC of 12 December 2008 adopting, pursuant to Council Directive 92/43/EEC, a second updated list of sites of Community importance for the Mediterranean biogeographical region (OJ 2009 L 43, p. 393; ‘the contested decision’) to the extent that it extends the site called ‘Estrecho oriental’ (‘Site ES6120032’) to the territorial waters of Gibraltar, both within and outside the site called ‘Southern Waters of Gibraltar’ (‘Site UKGIB0002’), and to an area of the high seas. 2. On the basis of the criteria set out in Annex III (Stage 2) …, the Commission shall establish, in agreement with each Member State, a draft list of sites of Community importance drawn from the Member States’ lists identifying those which [host] one or more priority natural habitat types or priority species. 3 On 19 July 2006 the Commission adopted, on the basis of the third subparagraph of Article 4(2) of the Habitats Directive, Decision 2006/613/EC adopting, pursuant to Directive 92/43, the list of sites of Community importance for the Mediterranean biogeographical region (OJ 2006 L 259, p. 1). 4 That list, in the annex to Decision 2006/613, included Site UKGIB0002, which had been proposed by the United Kingdom of Great Britain and Northern Ireland. 5 On 12 December 2008 the Commission adopted the contested decision, laying down an updated list of sites of Community importance for the Mediterranean biogeographical region. This decision still included Site UKGIB0002 and also included, for the first time, Site ES6120032, proposed by the Kingdom of Spain. 7 According to the introduction to that annex, each site of Community importance is identified by the information supplied in the Natura 2000 format, including the corresponding map, this information having been transmitted by the competent national authorities in accordance with the second subparagraph of Article 4(1) of the Habitats Directive. Also, the asterisk in column C denotes the presence on the site of Community importance of at least one priority natural habitat type and/or species within the meaning of Article 1 of the directive. 8 By application lodged at the Registry of the Court of First Instance (now ‘the General Court’) on 6 May 2009, the Government of Gibraltar brought an action for annulment of the contested decision to the extent that it extends Site ES6120032 to the territorial waters of Gibraltar, both within and outside Site UKGIB0002, and to an area of the high seas. 9 By a separate document, the Commission raised an objection of inadmissibility against the action pursuant to Article 114 of the Rules of Procedure of the General Court, contending that the Government of Gibraltar was not directly and individually concerned by the contested decision. 10 By order of the President of the First Chamber of the General Court of 16 October 2009, the United Kingdom and the Kingdom of Spain were granted leave to intervene in support of the Government of Gibraltar and the Commission respectively. 11 On 26 May 2010 the General Court, on the basis of Article 64 of its Rules of Procedure, requested the parties to give their views on the admissibility of the application for partial annulment of the contested decision, in particular in the light of the case-law according to which partial annulment of a European Union act is possible only if the elements whose annulment is sought may be severed from the remainder of the act. The parties replied within the prescribed period. 12 By the order under appeal, made under Article 113 of its Rules of Procedure, the General Court dismissed the action as inadmissible without initiating the oral procedure. 13 First of all it recalled, in paragraph 34 of the order under appeal, that, in accordance with settled case-law, partial annulment of a European Union act is possible only if the elements the annulment of which is sought may be severed from the remainder of the act and that the requirement of severability is not satisfied where the partial annulment would have the effect of altering the substance of that act. 14 Next, the General Court observed, in paragraph 38 of the order under appeal, that the Government of Gibraltar’s action sought not the annulment of the inclusion of all of Site ES6120032 in the list of sites of Community importance but its annulment only to the extent that it would extend the site geographically to areas not within Spanish territory. ‘39 The partial annulment of [the contested decision] as sought by the applicant, that is to say “to the extent that it extends [Site] ES6120032 to … Gibraltar territorial waters (both within and outside [Site] UKGIB0002) and to an area of the high seas”, would necessitate the alteration of the area of Site ES6120032, its location and geographical coordinates as stated in the Annex to [the contested decision]. Thus, the applicant’s application for partial annulment of that decision would require the Court to redefine the geographical limits of Site ES6120032. 40 The partial annulment of [the contested decision], as sought by the applicant, would alter Site ES6120032 entirely and would, therefore, alter the substance of [the contested decision]. In addition, there is no evidence that a new delimitation of Site ES6120032 would satisfy the criteria laid down in Annex III to the Habitats Directive for classification as a site of Community importance. 41 It must therefore be held that the elements of [the contested decision] which are sought to be annulled concerning the territorial waters of Gibraltar (both within and outside Site UKGIB0002) and an area of the high seas included in Site ES6120032, are manifestly not severable from the remainder of [the contested decision]. – order the Commission and the Kingdom of Spain to pay the costs before both Courts. 17 The Commission contends that the Court should dismiss the appeal and order the Government of Gibraltar to pay the costs. 18 The Kingdom of Spain contends that the Court should dismiss the appeal and order the Government of Gibraltar to pay the costs. 19 Under Article 119 of the Rules of Procedure of the Court of Justice, where an appeal is, in whole or in part, clearly inadmissible or clearly unfounded, the Court may at any time, acting on a report from the Judge-Rapporteur and after hearing the Advocate General, dismiss the appeal by reasoned order without opening the oral procedure. 20 The Government of Gibraltar puts forward five grounds of appeal. The first and second grounds allege that the General Court misapplied the rules relating to the partial annulment and the severability of European Union acts. By its third, fourth and fifth grounds of appeal, the Government of Gibraltar complains that the General Court distorted the clear sense of the evidence, infringed the rights of the defence and did not provide reasoning. 21 By its first and second grounds of appeal, the Government of Gibraltar complains, first, that the General Court failed to have regard to the fact that the present case is equivalent to rectification of a register of the extent of a property and not true partial annulment or severance. 22 The case-law upon which the General Court relied, in paragraph 34 of the order under appeal, concerns situations different from the one at issue here. The present case does not concern a challenge to a substantive legislative act, such as a directive or a regulation, or even a challenge to a substantive administrative act, such as a decision in a competition case, but concerns a challenge to the delimitation of a geographical area and whether certain parts should be excluded. 23 Nor does that case-law apply to a situation such as the one at issue here, where the Commission, in a manner that is patently incorrect and contrary to its constant practice, treats British Gibraltar territorial waters and the high seas as if they formed part of Spanish territorial waters. 24 Second, the General Court committed an infringement of European Union law by finding (i) that the partial annulment of the contested decision in the way sought would involve the General Court redefining the geographical limits, the area and the coordinates of Site ES6120032, thereby altering that site entirely, and would therefore alter the substance of the contested decision and (ii) that the elements which are sought to be annulled are manifestly not severable from the remainder of that decision. 25 The geographical limits of Site ES6120032 are not stated in the annex to the contested decision. It would be incumbent on the Commission to give due effect to the annulment sought, as regards the area and the geographical coordinates of the site at issue, in the context of its constant review, changes, corrections and updating of the lists of sites of Community importance. 26 Furthermore, Site ES6120032 minus the non-Spanish waters forms a coherent and enforceable designation capable of standing alone and can continue to produce legal effects. The reduction of the geographical area of Site ES6120032, as requested by the Government of Gibraltar, merely seeks to confine the area of that site to what is permissible under the Habitats Directive and cannot, therefore, alter the substance of the contested decision, whose content moreover the General Court did not state. 27 Finally, rectification is the form of annulment that best accords with the principle of proportionality, inasmuch as challenging the designation of the whole of Site ES6120032 could have resulted in the Spanish territorial waters of that site and the species and habitats which they host being left without the protection provided by the Habitats Directive. 28 The Commission and the Kingdom of Spain submit that the first and second grounds of appeal must be dismissed. 29 As the General Court recalled in paragraph 34 of the order under appeal, it is settled case-law that partial annulment of a European Union act is possible only if the elements the annulment of which is sought may be severed from the remainder of the act. The requirement of severability is not satisfied where the partial annulment of an act would have the effect of altering its substance (see, inter alia, Joined Cases C‑68/94 and C‑30/95 France and Others v Commission  ECR I‑1375, paragraphs 256 and 257; Case C‑540/03 Parliament v Council  ECR I‑5769, paragraphs 27 and 28; and Case C‑505/09 P Commission v Estonia  ECR I‑0000, paragraph 111). 30 The annex to the contested decision lays down a list of sites of Community importance, including Site ES6120032. In so doing, it designates the sites as a whole by stating first, their area in hectares and, second, the geographical coordinates of the centre of the site, namely its latitude and longitude, but does not specify separate geographical elements of which they may be composed. 31 That is also true of Site ES6120032 at issue here. 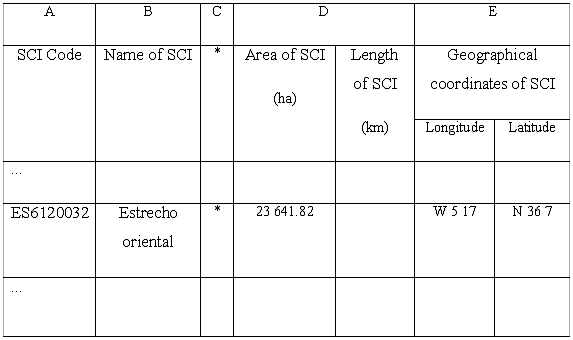 The only information concerning this site in the annex to the contested decision is its designation ‘Estrecho oriental’, its area of 23 641.82 hectares and its geographical coordinates, W 5 17 for longitude and N 36 7 for latitude. Separate geographical components within the site, and in particular the different geographical areas of which the site is allegedly composed and in respect of which the partial annulment of the contested decision is sought by the Government of Gibraltar, are not referred to in the decision. 32 Nor does the Government of Gibraltar identify those areas in accordance with objective and concrete geographical coordinates, but designates them only on the basis of legal criteria. However, in the system of the Habitats Directive such criteria cannot identify different areas within a site on the basis of which that site might be split. 33 Furthermore, according to the definition laid down in Article 1(j) of the Habitats Directive, a site is a geographically defined area whose extent is clearly delineated. It is apparent from Annex III to the Habitats Directive, in particular from point A(b) of Stage 1 and point 2(c) and (e) of Stage 2, that the criteria for selecting sites eligible for identification as sites of Community importance are assessed in relation to the site concerned as a whole. Accordingly, the partial annulment of the designation of such a site would have the effect of altering the site’s substance. 34 It follows from the foregoing considerations that the designation of Site ES6120032 as a site of Community importance in the annex to the contested decision is an inseverable whole. Accordingly, the General Court correctly concluded that partial annulment as requested by the Government of Gibraltar is not possible and that the action is therefore inadmissible. The question whether, on the merits, the designation of Site ES6120032 complies with the Habitats Directive has no effect on the action’s admissibility. 35 In the light of the considerations put forward by the Government of Gibraltar as a basis for its action and having regard to the wording of the form of order sought by it before the General Court, the partial annulment requested cannot be regarded as concerning mere rectification of the data that enable Site ES6120032 to be identified. 36 Consequently, the first and second grounds of appeal must be dismissed as clearly unfounded. 37 By its third ground of appeal, the Government of Gibraltar contends that the General Court distorted the clear sense of the evidence in the file by holding, in paragraph 40 of the order under appeal, that there was no evidence that the new delimitation of Site ES6120032, as requested, would satisfy the criteria laid down in Annex III to the Habitats Directive for the site to be classified as a site of Community importance. 38 The General Court failed to take into consideration the conclusive evidence in the file establishing that four habitat types and three species – including one priority species – listed respectively in Annexes I and II to the Habitats Directive are present in the Spanish territorial waters of Site ES6120032, a fact which was not contested by any of the parties. Accordingly, it was obvious from the documents on the file that the site minus the non-Spanish waters meets the directive’s criteria for designation as a site of Community importance. 39 The fifth ground of appeal, like the third, concerns the finding made in paragraph 40 of the order under appeal, the Government of Gibraltar submitting that this finding is not supported by any reasoning. 40 By its fourth ground of appeal, the Government of Gibraltar contends that the General Court infringed its rights of defence in that it did not grant it an opportunity to comment on the replies of the other parties to the proceedings concerning the question of inadmissibility raised by the General Court. Those replies, which influenced the General Court, were incorrect. If the Government of Gibraltar had had an opportunity to comment on the replies, it would have made the same arguments as those under the second and third grounds of appeal. 41 That breach of the rights of the defence is aggravated by the fact that the General Court did not open the oral procedure although the Government of Gibraltar so requested. In addition, given that here the issue of admissibility is so closely connected to the facts and to the consideration of the merits of the case, it is inappropriate not to reserve examination of the action’s admissibility and the contested decision’s severability for final judgment. 42 It must be stated that it is clear from paragraphs 29 to 35 of the present order that the partial annulment of the contested decision as sought by the Government of Gibraltar is inadmissible because the designation of Site ES6120032 as a ‘site of Community importance’ is inseverable, without any relevance attaching to the question whether the part of the site that is not concerned by the action for annulment is capable as such of being classified as a site of Community importance under the criteria laid down by the Habitats Directive. 43 In those circumstances, the third and fifth grounds of appeal, concerning the finding made in that regard by the General Court in the second sentence of paragraph 40 of the order under appeal, cannot secure the setting aside of the order and are therefore clearly ineffective. 44 So far as concerns the fourth ground of appeal, alleging a breach of the rights of the defence, the Government of Gibraltar acknowledges that the General Court requested the parties to submit their observations on the ground for inadmissibility of the action which it applied of its own motion. 45 Furthermore, it should be noted, first, that it is clear from Articles 113 and 114(3) and (4) of the Rules of Procedure of the General Court that the General Court is under no obligation to hold a hearing or to give the parties the opportunity to comment, in writing, on replies submitted by the other parties to the proceedings on the question of inadmissibility. Second, it is apparent from those provisions that it is for the General Court alone to assess whether it is appropriate to decide immediately on a plea of inadmissibility or to reserve its decision for the final judgment. It follows that in deciding, in the case in point, to rule on the admissibility of the action without in addition opening the oral procedure, on the ground that it considered itself to be sufficiently informed by the documents in the file, the General Court is not open to the reproach directed against it (see, to this effect, the orders of 21 November 2005 in Case C‑482/04 P SNF v Commission, paragraph 30, and of 8 December 2006 in Case C‑368/05 P Polyelectrolyte Producers Group v Commission and Council, paragraph 46). 46 Finally, it is clear from paragraphs 29 to 35, 42 and 43 of the present order that the arguments made under the second and third grounds of appeal, which the Government of Gibraltar would have wished to rely on before the General Court, cannot call into question the inadmissibility of the application for partial annulment. 47 It follows from the foregoing that the fourth ground of appeal is also clearly unfounded. 48 Since the grounds of appeal put forward by the Government of Gibraltar are clearly unfounded, the appeal must be dismissed in its entirety. 49 Under Article 69(2) of the Rules of Procedure of the Court of Justice, which applies to appeal proceedings by virtue of Article 118 thereof, the unsuccessful party is to be ordered to pay the costs if they have been applied for in the successful party’s pleadings. Since the Commission has applied for costs and the Government of Gibraltar has been unsuccessful, the latter must be ordered to pay the costs. 50 In accordance with the first subparagraph of Article 69(4) of the Rules of Procedure of the Court of Justice, which is also applicable by virtue of Article 118, the Kingdom of Spain is to bear its own costs. 2. The Government of Gibraltar shall pay the costs. 3. The Kingdom of Spain shall bear its own costs.